In some plays, accents are required of characters whose native language is not English. This occurs in both The Merry Wives of Windsor and Henry V. In the former, Dr. Caius, the physician, speaks English with a French accent and Hugh Evans, the schoolmaster, speaks English with a Welsh accent. The different accents of the four captains in Henry V illuminate a central theme in the play. Fluellen, the second largest part, speaks with a Welsh accent. The printed text indicates the use of an Irish accent for MacMorris with the substitution of ish for is. Also, Chrish for Christ, and a Scottish accent for Jamy with the repetition of gud for good. The text also indicates the use of sall for shall and the substitution of ay for I. If actors adopt the suggested nationalist accents for these characters, the question then is raised as to what to do with the speech of Gower, the Englishman. We would suggest that, in this one instance, an exception be made to our preference for American speech. The use of an English accent for Gower can accentuate the linguistic differences amongst the characters. It can also point up the competing regional or national interests in both Shakespeare’s and Henry’s Britain. It can do that as well as reflect those of our own world. In Henry V, both Katherine and Alice speak English with a French accent. Their accent is indicated with the substitution of d for th and wat for what. In turn, Henry’s attempt to address Katherine in her native tongue provokes laughter on her part. There is no indication in the text about the accuracy of the Boy’s French accent as he interprets between Pistol and the French soldier. However, he does seem to have achieved a basic familiarity with the language while on campaign. In Henry IV Part One, there is no orthographic suggestion as to the adoption of an accent for the part of Glendower. An accent might be employed to excellent effect considering that he is a native speaker of Welsh. In addition, Hotspur seems to insult Glendower with the gibe that “no man speaks better Welsh”. Productions have sometimes used a trace of a Spanish accent for Katherine in Henry VIII. 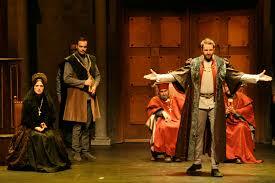 They have also used French accent for the Queen in Richard II and for Margaret in the Henry VI trilogy. The text of King Lear calls for a Somersetshire dialect when Edgar confronts Oswald. The text indicates this with the substitution of z‘s for s‘s and v‘s for f ‘s among others. It is best learned from a native speaker or from a dialect CD. Questions often arise as to the efficacy of a dialect in the portrayal of the rustic or lower class characters. Our preference is for the use of American speech rather than stage Cockney or generic lower-class English speech and so we follow this standard in our Audio Shakespeare Pronunciation Guide. A wide variety of American regional dialects is available. Their usefulness will depend on the setting and location of the stage action. The Audio Shakespeare Pronunciation Guide is available now. Get your copy today!